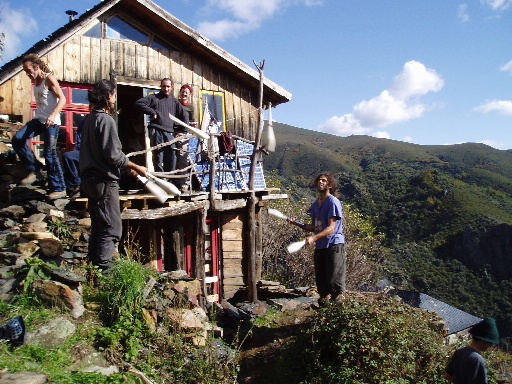 High in the mountains of León province, north west Spain, is an eco-village crafted from the site of an abandoned village. Unfortunately I did not make it to the site and there is an excellent first-hand account by Tony Wrench in Permaculture Magazine if you want to hear from someone what it was like. However, drawing on this and other sources I thought it still worth summarising a little about the place. The village is 1,000 metres above sea level in a valley of the Rial river about 4 km south of San Facundo. It has good sun aspect but is sheltered from the harshest of the winds. Like many remote villages in Spain it still has reliable access to good spring water – secured via a 2 km leat from an adjacent valley. 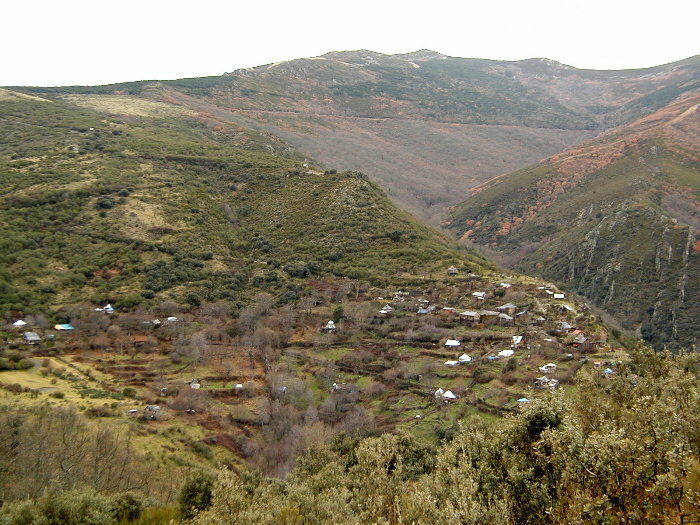 The village is purposefully remote, with no road and access either by a two hour walk from San Facundo (to the north) or a difficult drive up mountain tracks via Foncebadón (to the south). Tony Wrench describes it as “an isolated place of extremes” (p.6). At 3,000 hectares (7,400 acres), the site is a depopulated village established centuries before and left empty in the 1970s. 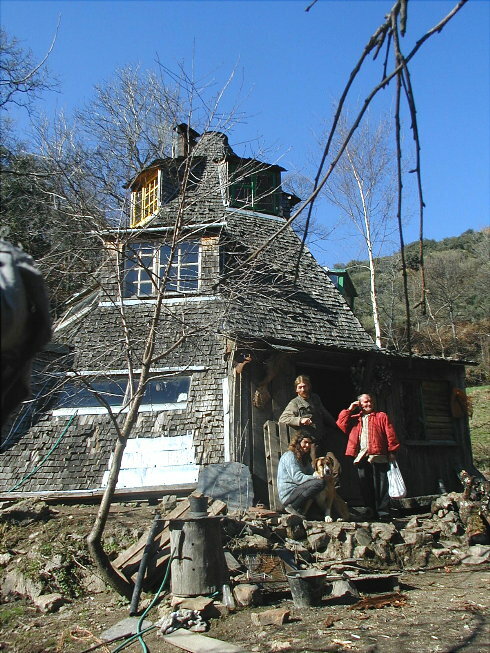 In 1989 an international group pf people (German, Danish and Spanish) chose it as a place where they could be an autonomous and self-sufficient eco-village free from the interferences of the world beyond. The village itself is organised via a council (consejo) which meets weekly and makes decisions via consensus. All residents are expected to contribute a day a week to communal tasks (such as maintenance), all waste has to be manually carried out from the village and with the lack of roads donkeys tend to be used to transport goods. Due to its remoteness it appears to be relatively free from planning constraints. Although still very much an active village, Matavenero along with its neighbour Poibueno, has suffered from a decline in its population in recent years. For the first eight years there were up to 110 residents and 40 children, more recently however the population has fallen to below 40 adults. The reasons for this decline are numerous but include the difficulty in accessing it, the lack of a high school (though the state has provided a teacher for primary education), lack of income (most people have to leave the village to earn money (that said, money has little value once in the village), personal tensions, and the shear hard back-breaking work of living in a truly sustainable lifestyle. This includes not ony tending vegetables in numerous terraces, or collecting from fruit trees, but the significant effort required to collect firewood, and the amount of communal maintenance necessary (which is obviously getting more burdensome as the number of people around to do it decreases). In fact most of the eco-communities I have visited in the past few months have been looking for more members. I have never found a place over-subscribed. So what is it about these places, diverse in their form and organisation, that so limits their population? Does this lack of participants speak to a fundamental flaw in eco-village/ community/ neighbourhood approaches, or more to an apathy and distate in the population at large towards the effort required to live more sustainably? Is such a life too far removed from existing culture to encourage more to take the step? This gulf is, obviously in Matavenero’s case, widened by being in such a remote and isolated location. It is hard for others to even sample the sustainable life, let alone make a full-time commitment to move in. As such Matavenero significantly limits its ability to influence others. It is a purposefully self-contained place of sustainability, not intended to convince others of the virtue of such a like. Unlike places such as Lammas or La ecoaldea del Minchal, it does not seek conversations with its neighbours, to run workshops, or educate beyond its realm. Instead it is a quiet place of peace and individual perseverance. This individuality is represented in its avocation and practice of do-it-yourself self-reliance. If you want food, you grow it. It you want a house, you build it. This is of course most unlike how the rest of society operates. The principle way in which eco-housing at Matavenero has been made affordable is in its location on land that few others were interested in. However, it aptly illustrates that we cannot simply rely upon cheapness of land as a way of making eco-housing affordable. Low-cost green building needs to be in places where people are able to have choices about their lifestyle, income and interaction with society. We need to create space for them in more sought-after locations and in order to do that find other ways of making them affordable. In addition to its isolation there is another lesson to be learned about green building from Matavenero. That is the importance of comfort and efficiency and how the two are mutually constituted. A key principle of permaculture (a philosophy and practice which influences many eco-communities) is to not create waste. In other words to use all resources to their maximum potential. This is similar to another principles of ‘least input, maximum yield’. Thus, for example, the faeces from a compost toilet (after several years of decomposition) are used to fertilise the land. If eco-houses are well built any energy input can have multiple benefits. So, for example, a wood stove might heat a space, heat water and be used for cooking, Not only do you need to use appropriate technology to achieve this (have a stove with a back-boiler and cooker top) but it also needs to be used in a space which will make the most of the energy – so a highly insulated house with adequate, but not excessive, ventilation. Thus efficiency of use of a resource, in this case wood, also creates comfort in life – warm spaces and hot water. To achieve this you need good eco-design and adequate technology. This involves more than simply building with natural materials, or structures which sit lightly on the earth (like yurts which require no foundations). It pushes the definition of a good eco-building to being as much about efficiency (which is good for the environment) and comfort (which is good for humans) as it is the materials used to achieve this. There is always a balance or compromise to be made here. We might still want to use as many local natural materials as possible (and not rely on concrete or steel), but we should not do this to the detriment of understanding how efficient a building will be to live in. This efficiency and comfort appears to be missing from many houses in Matavenero which require large amounts of firewood to stay warm and this heat is not used to heat water for showering through back-boilers. Although there are a broad range of buildings – renovated old dry stone slate houses, domes and wooden houses – the emphasis is upon natural materials and the outcome are buildings which can be tough to live in, however wonderful they look. We need to consider the importance of resource efficiency and comfort not just to reduce the gulf between societies’ expectations of what a home should provide and current eco-building practices, but because living sustainably should not have to be such hard work. If I appear overly critical of Matavenero and their achievements that is not my intention. Few communities survive as long as they have or achieve what they have achieved. It is in my academic nature, however, and the purpose of this project to critically reflect upon the implications of different approaches to eco-building and always explore ways in which we can improve. There are no right ways or wrong ways in this, only questions and reflections upon alternative practices. I would love to hear from anyone who has recently visited Matavenero, or indeed lives there. Please also let me know if I have misunderstood or misrepresented anything about the village and I will change it. Que bueno el proyecto teneis me encantalo. Yo quieria hacer algo parecido por mi mismo en espana. Podeis dame unos consejos porfavor. Have visited Matavenero April 2010 , and can say that there live about 70/80 people in warm season, and mostly they`re very welcoming. The day of work for community, council every week, or common bread baking are past. The village moved to the level where not everyone wants to socialise, and the right to that is widely respected. The place is quiet, but it doesn`t look abandoned. I heard about first settlers who left, but there are families for 20 years and I met young couples which came just few season ago..and enjoy they own stay. There`s a problem with secondary, the nearest is in Ponferada, and students have to move there. Other thing is a language, most popular are German and Spanish, maybe 8 people speak English, and I`m not native to any of them. As people say, winters are very difficult. Remote location is not an issue for drivers…it`s 20 minutes walk to dust road. I left in beginning of May .. it was snowing. Thank you for this review of Mataverero – very useful to know what it is like up there as I am sure many others want to visit it too. It is definitely a place that I would like to go to, but next time I might have to resort to driving. do you have contact with this people or other people of other communities? Or is their a way to get in contact with people who live in such a community.